Before the holidays, I wrote about the enablement issue in this case. Today I’ll talk about the inducement issue, which involves two significant—and probably erroneous—doctrinal developments. I say “probably erroneous” because in my view at least one, if not both, would likely be reversed by the Supreme Court were it to grant cert. The short version is that the majority held that in 35 U.S.C. 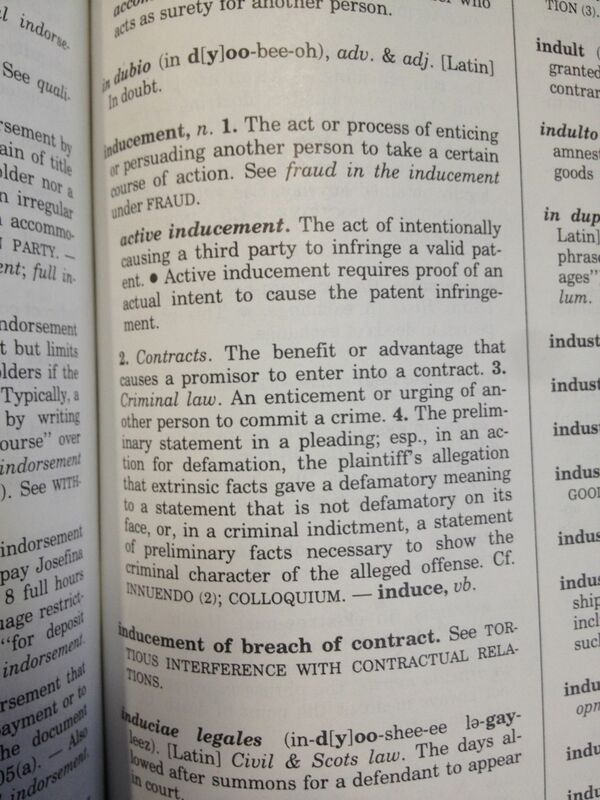 § 271(f)(1), “induce” means “specific intent to cause” and “a substantial portion of the components” includes “a single important or essential component.” The consequence of the former is that one can induce oneself; the consequence of the latter is that merely supplying a single “main” or “major” component of the claimed invention is sufficient for purposes to 271(f)(1). Judge Prost dissented as to “induce” and would not have reached the “substantial portion” issue. The patent claim: The asserted claim, claim 42 of patent No. RE 37,984, is directed to “[a] kit for analyzing polymorphism in at least one locus in a DNA sample.” The claim limitations involve vessels containing a variety of materials: a mixture of primers, a “polymerizing enzyme suitable for performing a primer-directed polymerase chain reaction,” adenosine, guanine, cytosine and thymidine, a buffer solution, and template DNA. Procedural History: At trial, the jury was instructed to consider liability for all “United States sales,” which included “all kits made, used, offered for sale, sold within the United States or imported in the United States as well as kits made outside the United States where a substantial portion of the components are supplied from the United States.” Id. at 11 (emphasis added). LifeTech preserved its challenge to the italicized language. The jury returned a verdict finding that “all of LifeTech’s worldwide sales were attributable to infringing acts in the United States.” Id. The district court subsequently granted JMOL in LifeTech’s favor. (emphasis added). LifeTech raised two legal grounds for affirming the district court’s grant of JMOL. First, it argued that 271(f)(1) requires inducement of another; one cannot induce oneself. Thus, it could not be liable under 271(f)(1) for exporting the Taq polymerase to itself to combine with the other components. Second, it argued that 271(f)(1) requires that a “substantial portion” of the components be exported; “one” component is not a “substantial portion” of the components. The majority’s pseudo-textualist analysis: I’m thoroughly unconvinced by the majority’s analysis. Setting aside the majority’s reading of the legislative history, which Judge Prost criticizes in her dissent, its textual analysis is deeply flawed. Proper textualism involves the consideration of the ordinary meaning of words, evaluated in context, and an application of the canons of statutory construction. But just as in patent law, “ordinary meaning” doesn’t just mean “ordinary meaning.” Rather, terms with a legal meaning (such as “person”) are given their ordinary legal meaning. The problem with the majority’s analysis begins with its reliance on a general-purpose dictionary for a term that has a well-established legal meaning and goes downhill from there. While “induce” might mean “to bring about, to cause” in the general-usage context, in the legal context—and particularly the patent law context—its meaning invariably involves a relationship between two separate persons. I am not aware of any instances (but would be interested to learn of them) where courts have interpreted “induce” as encompassing one’s own performance of the proscribed acts. This is especially true with respect to 271(b), where both the Federal Circuit and the Supreme Court have written extensively about the requirements for the relationship to rise to the level of inducement. One would not “induce” infringement of a patent by using a machine to carry out a claimed process; one would be liable for direct infringement. To treat the word as if it were necessary to start from first principles, looking it up in a general purpose dictionary, is to ignore all of this well-established legal meaning. Congress did not have the benefit of Professor Garner’s text in 1984, when it passed 274(f); this definition comes from the 1999 version of Black’s. * But my sense is that Garner’s definition is a lot closer to the legal meaning of “actively inducement” than “http://www.merriam-webster.com/dictionary/induce.” Slip Op. at 23. And to the extent it is descriptive of the legal meaning, it unquestionably supports the interpretation as involving another person. Edit to add a legal citation: “It is, however, well established that “[w]here Congress uses terms that have accumulated settled meaning under… the common law, a court must infer, unless the statute otherwise dictates, that Congress means to incorporate the established meaning of these terms.” CCNV v. Reid, 490 U.S. 730 (1989) (quoting NLRB v. Amax Coal Co., 453 U.S. 322, 329 (1981)). Edit to add a citation: “Ordinarily, ‘Congress’ silence is just that—silence.” CCNV v. Reid (quoting Alaska Airlines, Inc. v. Brock, 480 U.C. 678, 686 (1987)). Judge Prost’s Dissent: Judge Prost’s dissent identifies another problem with the majority’s interpretation: that interpretation is foreclosed by precedent. “[W]e have never before held—in the context of either § 271(f) or § 271(b)—that a party can induce itself to infringe. And for good reason: this conclusion runs counter to unambiguous Supreme Court precedent.” Dissent at 2. Twice the Supreme Court has held that inducement liability requires a third party. In interpreting the phrase “induces infringement” in § 271(b), the Supreme Court wrote that it requires “that the inducer lead another” or “persuade another.” Global-Tech Appliances, Inc. v. SEB SA, 131 S. Ct. 2060, 2065 (2011) (emphases added). Additionally, in Metro-Goldwyn-Mayer Studios Inc. v. Grokster, Ltd., a case in the analogous copyright context, the Supreme Court stated that inducement is defined as “entic[ing] or persuad[ing] another” to infringe. 545 U.S. 913, 935 (2005) (emphasis added). The majority cannot point to a single case—from the Supreme Court or otherwise—that supports its contrary interpretation of inducement. Judge Prost might go too far in arguing that the majority’s interpretation is foreclosed by precedent (As the majority points out, none of these cases directly confronted the question of whether one can “induce” oneself), but her underlying point is sound: these cases demonstrated that the meaning of “induce” is already well-established as requiring another person. Every “essential” component is a “substantial portion of the components.” The majority also interpreted the requirement that “all or a substantial portion of the components of a patented invention” be supplied, concluding that “substantial portion of the components” includes “a single important or essential component.” Slip Op. at 27. Here, that component was the Taq polymerase, a widely-used enzyme for polymerase chain reaction. The court concluded that supplying Taq was enough based on the following evidence: “Without Taq polymerase, the genetic testing kit recited in the Tautz patent would be inoperable because no PCR could occur. LifeTech’s own witness admitted that the Taq polymerase is one of the “main” and “major components of the accused kits.” Id. at 32. As the Taq example demonstrates, under the court’s interpretation any component of a patented invention is an essential component. If one removes Taq, the kit won’t work; if one removes the primers, the kit won’t work; if one removes the nucelotide bases, the kit won’t work. This has the potential to greatly expand liability under 271(f)(1). The only differences between the two are that (f)(2) is limited to components that are “especially made or especially adapted for use in the invention and not a staple article or commodity of commerce suitable for substantial noninfringing use;” a knowledge of infringement requirement in (f)(2); and the “intending that such component will be combined” language of (f)(2) versus the “in such manner as to actively induce the combination” language of (f)(1). The first two differences make (f)(2)’s scope narrower than that of (f)(1), and the third does not constitute a meaningful difference under the majority’s interpretation of “actively induces.”*** The result is that, under the majority’s interpretation, I can’t envision any conduct that would fall within (f)(2) that would not also fall within (f)(1). *The older definition of “induce” from Black’s doesn’t provide much interpretative help in my view. 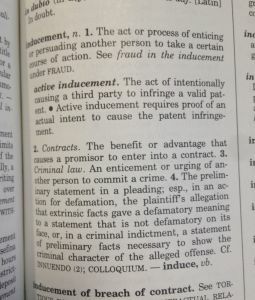 See Black’s Law Dictionary, Fourth Edition (West 1951) (defining “induce” as “to bring on or about, to affect, cause, to influence to an act or course of conduct, lead by persuasion or reasoning, incite by motives, prevail on”) (this definition was carried forward through at least the 1990 version). Part of my ambivalence is that without looking at the source of the definition, it’s not clear that another party isn’t required. And once you look at the source of the definition, it’s apparent that the case wasn’t talking about the legal meaning of “induce” but it’s general purpose meaning. See State v. Stratford, 55 Idaho 65 (Idaho 1934). **Nor does the argument that the majority’s interpretation still imposes an “intent” requirement change the analysis. The majority concludes that “actively induce the combination” means “merely the specific intent to cause the combination of the components of a patented invention outside the United States.” Slip Op. at 23. This is nothing more than a volitional conduct requirement: a person that combines the elements will necessarily have the “specific intent to cause the combination” except in very rare, very unusual circumstances. And the jury instruction discussed above did not mention any requirement of intent. ***If “actively induce” were interpreted as requiring the participation of a third party, then there might be a difference between the two in that a reasonable reading of 271(f)(2) is that it covers one’s own combination of the components. Side note: This appeal is one of the two that were at the heart of In re Reines; Ed Reines represents LifeTech. In the other appeal, the district court’s judgment in favor of Promega was summarily affirmed in March. Comments are welcome. My comment moderation policy is in effect. January 16, 2015, 2:57 PM ET) — Promega Corp. and Life Technologies Corp. have lodged dueling petitions each urging the Federal Circuit on Wednesday to review portions of its decision to undo a federal judge’s order vacating Promega’s $52 million patent win over the alleged infringement of its gene-testing technology while still invalidating all but one of Promega’s asserted patents. …as you decide to ignore the usual one of 1 USC 1….? To be clear, I ‘get’ what you want to focus on: the US supply side of a staple of commerce; but that is just NOT the focus of the law; leastwise here when it is the inducer being the outside of the US entity doing something outside the US – that if done in the US would be infringement. What you want to focus on is parsed and does not take the law as what the law covers. This is not an anti-export law (on its own in the ‘per se’ way you want to treat it). I have politely now several times indicated that you really do need to take and understand the entirety of the law and not be fixated on a US supplier side export of a staple of commerce. That type of view simply does not close the loophole as Congress wrote the law to do. That way we’re sure to be persuaded. This strawman was addressed downthread already. If you have a patent in the US only and you actually believe this holding has any legs, the clever thing to do now would be to (1) identify if there are products that would be covered in Europe, Japan, Canada or China if you also had a patent there; and (2) figure out if at least one staple component of that invention is sourced from the US. Then file suit against the US supplier of that staple component, informing them of the combination overseas and arguing that by knowingly supplying an “important” component to this overseas manufacture, they are actively inducing infringement under 271(f)(1). Then, of course, you go after foreign company who is making the combination that “would infringe” if the combo occurred in the US. After all, by request and payment to the US staple item of commerce supplier, the foreign company is causing that “important” staple item of commerce to be “supplied in” the United States. Read it again and note just who the entity that would be the inducer would be. Hint: it is not necessarily the US supplier of the staple item of commerce. And by “not necessarily,” this means that yes, if the US supplier also happens to be the overseas entity that is the entity that is inducing an action (as opposed to inducing another entity), then liability may be incurred. And that IS what Congress intended. “anon” : Read it again and note just who the entity that would be the inducer would be. Rather than tr0ll the thread with your guessing games, please use the English language and tell everyone (1) who you believe “the inducer” is in each of the scenarios I described; and (2) why you believe that you’ve made a different point than the one made in my comments. Also let everyone know if you disagree with my proposed method for “monetizing” the holding in this case. You seem to believe the holding is correct and the majority has the better arguments. Is there some reason that patent attorneys should not be trying to exploit the holding and make some money by finding actors engaging in the benign acts (i.e., supplying overseas entities with a single staple item of commerce that happens to appear in a US patent claim) that puts those actors at risk of infringement? Because I’m pretty sure there are lots and lots of such actors out there. According to 271(f), which party is it that is the aim of the law? “anon” that IS what Congress intended. As I’ve already stated: if Congress intended to make infringers out of foreign entities who (1) purchase a single staple good and (2) use that single staple good to legally practice, in their own countries, the subject matter of a US patent claim, then Congress could simply have said so. They could have said so in the Congressional record (they didn’t) or they could have written a statute plainly forbidding that activity (it’s easy to do — I just showed you how to do it). But that’s not what Congress did. Congress did something very different. In particular, with respect to single items of commerce, they went out of their way to say the exact opposite (that’s 271(f)(2)) and preclude single staple items of commerce from the statute. 271(f)(1), in contrast to 271(f)(2), was plainly written to cover the supply of uncombined component(s) [plural] in a manner which actively induces the combination of those uncombined components into an otherwise infringing article overseas. Selling staple items of commerce is called “doing business.” The majority’s soon-to-be nullified opinion here does nothing except destroy US manufacturing jobs and replace them with more work for patent trolls. Of course, that’s a bad habit of the Federal Circuit that we’ve all seen before. Whose side are you on? Your “plural” still ig nores the singular nature of “portion,” as well as ig nores the statutory construction doctrine of (singular/plural) words – as noted by the majority. I’m ignoring the “singular nature” of the term “portion” because it’s irrelevant, just as the singular nature of the terms “manner” and “patent” are irrelevant. For the tenth time, 271(f)(1), on its face, requires that uncombined components [plural] are supplied. It’s the manner in which those uncombined components are supplied that “actively induces” their combination overseas. This is clear from the plain lanuage of the statute, it’s clear from the statutory history, and it’s clear from comparison with 271(f)(2) which covers single components and plainly excludes the export of a single staple component from its scope (for obvious reasons). It’s hilarious that you can not stop yourself from accusing me of “ignoring” the languge in the statute when the majority’s analysis is among the most truncated piles of self-servin hooey that the Federal Circuit has ever served up. Your “side” question is immaterial as I am on the side of understanding the law as written by the constitutionally duly appointed branch of the government. As I have faithfully done here. Famous patent pundit Hal Wegner referred to the majority’s analysis of 271(f)(1) as a “tour de force” (definition: “an impressive performance or achievement that has been accomplished or managed with great skill”). Maybe Hal will read the comments here and give his verdict a second thought. Or maybe he will double down. It strikes me that on “induce” this is a great teaching case, to reveal how a word or sentence which you thought had an unambiguous meaning turns out to be susceptible of more than one meaning. are Section 60, sub-sections 1, 2 and 3. They also recite “induce” and “staple commercial product”. I wonder therefore, could the reasoning of the Federal Circuit majority carry the day in the UK, or does the wording of the UK Statute shut it out? One more thing. It is often observed that the EPO judges who decide on what a claim means and whether it is valid are without any career experience of judging infringement cases, and that can colour their opinions on what a claim means. As I understand it Chen wrote for the majority and Chen’s career path to the Federal Circuit was through the USPTO. If it isn’t too impertinent, may I ask, how many years of experience has he had, as a judge in infringement cases? It occurs to me that reliance on a general dictionary to discover the meaning of a word is a failing at the USPTO, (perhaps encouraged by Phillips?). Often, when you look in a dictionary, you can find a definition which manifestly does not fit. That fact alone should be enough to disqualify any of the other dictionary definitions from adoption as the “correct” one that one must adopt, to reflect the meaning intended by the draftsperson. Certainly, at the EPO, trying to win an Appeal Board case by relying on a general dictionary definition is most inadvisable (because it is given peremptory short shrift). The EPO Boards know that divining the right meaning of a text is a bit more subtle than that. Is this weak resort to a dictionary as a crutch another indication that Chen’s thinking processes are ones he acquired while serving within the USPTO? In short, the majority has a much better and cogent position. The dissent rests on a short and flawed thinking, and does a bit of hand waving in a whatever sense that lawyer-(and lawyer-like people) should find off-putting, or at least not befitting a Chief Judge. The majority does include additional comments directed to the dissenting opinion, and those comments should be read carefully (they seem to be simply dismissed out of hand by multiple commentators). Prof Rantanen appears to provide a several pronged view as to why he feels the majority position is challengeable. His opinion of the majority positon as “thoroughly unconvincing” is itself thoroughly unconvincing, seeing as his treatment of Prost’s flawed view is nonexistent (the flaws still exist, whether treated or not). 1) Meaning of the word “induce” – sources to use while divining that meaning. The Majority position is simply developed in better detail than either the Professor’s or the dissent. 2) Overly critical of “legal meaning” – using only his chosen (and a different word at that) legal meaning as the only legal meaning and ignoring the legal meaning offered by the majority. The “going downhill” applies to Prof. Rantanen every bit as he claims it applies to the Majority reasoning. He assumes his own conclusion that the word “must” involve more than one person and only focuses on that pre-ordained conclusion, ignoring the actual usage of the word by Congress and the fact that the object of the word as used by Congress is an action as opposed to being a person. Likewise (as I indicated in my earlier comment, Prof. Rantanen places TOO heavy a parallel with 271(b), and this even after the Majority position discussed why doing so was error. 271(f) simply does not track the (a)-(b) structure as the Professor’s desired usage would need it to do. Because of this, the “flaw” the professor sees as ignoring the meaning in (b) is in fact NOT a flaw at all. It is merely not assuming that the (b) use is dispositive for (f) – and such is, in fact, NOT dispositive for (f), given that (f) was not written at the same time, by the same Congress (an aspect of statutory construction left out of the discussion by the good professor). 3) Forcing the Black’s Law Dictionary use is not proper. The fact that a similar entry exists is simply not dispositive for the desired word entry. Yes, such a reference (even a post-dated one) may be reflected as an indicator, but a closer look at context and the actual words of Congress eliminate this indicator. As mentioned, the object of the word used by Congress was an action – not a person. This context controls, and the desired support is just not that strong. 4) The “knows how to say” prong. The good professor repeats his timing error, as the parallel invoke mechanism applies when the parallel sections were written by the same Congress. As already mentioned, (f) is not in parallel so the Professor’s entire analysis on this point is flawed beyond repair. For example, the notion the (b) closeness renders the meaning derived by the majority as “worse” is not appropriate. The majority’s discussion of this facet of their analysis is simply the better discussion out of any offered discussions yet. 5) Dissent – foreclosed by precedent. Simply in error, as shown by the majority. Prof. Rantanen’s clinging to the Prost-view regarding “another” and “induce” is odd. He ignores the points made by the majority (e.g., the legal notions as in footnote 9) at the same time he barely indicates that the majority ripped Prost’s reasoning apart in at least that the precedent Prost relies on is not there for what Prost wants it to say. Further, the meaning of induce as presented by the majority – a legal meaning – is equally “already well-established.” Prof. Rantanen simply ignores that the object of the verb – as used by Congress – was an action and not a person. That Prof. Rantanen wants a different meaning is merely that: a want. 6) Entities that must be careful. I think the professor is in error in how he portrays just which branch of the government has set the policy. I think it clear that the majority position is not setting policy, as it is reflecting the policy set by Congress, who was rejecting the policy setting of the Supreme Court. When Congress acts to close a loophole, they do not act solely on the bare facts of the case that the Court identifies as creating the loophole. The majority position clearly – and cogently – explained this. Thus it is error to say that the CAFC panel majority is creating policy here. The policy already existed, and the fallout of that policy choice remains what it is. For example, one fallout may in fact be that foreign entities do not source staple goods from the US. That is an aspect of the law – as written by Congress – that was always there. That aspect was always there because Congress did in fact depend on that aspect as the means of addressing the sovereignty issue of applying US law to an actor outside the shores of the US (and it should be noted and emphasized that (f) has no requirement for importation back into the US for its reach to a foreign actor to attach). Put simply, it was the policy intent of Congress to reach a foreign actor for US patent infringement based solely on that actor’s actions reaching into the US, even for staple goods, if the sum total actions of that foreign actor would constitute infringement if those foreign actions (the object of the “induce”) would meet the test of infringement if done on our shores. To this extent, I affirm the view posted by Random Examiner, who aptly (and not-so-surprisingly-“in silence from his friends” pointed out that Malcolm’s views of Congress’s actions are – to be blunt – dead wrong. 7) Every element – essential – substantial portion. I have not finalized my thoughts on this aspect, but I would at the onset draw distinctions between the doctrine of all elements for infringement and the notion of a particular element as being a substantial portion of a kit of components. This would be a highly nuanced discussion, and more care than I have seen so far in the comments would need to be maintained. For the takeaway of this case, though, the singular nature for both (f)(1) and (f)(2) remains undisturbed by any wishful thinking of what the law should cover. The words that Congress did use, – and the statutory doctrine identified by the Majority – (the singular/plural reading) carry the day. 8) The supposed (f)(2) superfluousity. What Prof. Rantanen sees as the deepest flaw, I see as flawed in its own origination. As I have already pointed out, the professor’s handling of the word “adapted” renders his point on this matter superfluous at the onset. In fact, the fact that Congress developed not one but two sections to close the loophole speaks to the extensiveness of the desire of Congress to shut down any games that entities may seek to employ to escape infringement by activities on foreign shores that still reach US sovereignty by a tie to a US supplier, even a supplier of a staple good. As noted by others, the conduct that the professor cannot envision can include kitting additional tangential goods outside of the direct claim elements. That the Professor repeats his earlier error by seeking to reference Blacks’ is simply a point that need not be addressed. The Professor’s ambivalence carrying over from the other portion of the discussion should not enter his pondering on this question (instead, I would encourage the professor to take the more traditional legal thinking of “even for argument’s sake” and to attempt to develop his point on this prong by accepting what he does not want to accept regarding induce the action rather than a (different) person and use that platform here for argument’s sake. Let us know when you do. It’s extremely important, not only for the result in this case but for every company who makes and sells staple items of Congress. There certainly was no “nuance” in the majority’s ridiculous analysis. They simply butchered the plain language of the 271(f)(1) so severely that it covered the export of a single staple item of commerce. As I’ve said: it’s absurd. The correct analysis is straightforward. As I’ve explained already, a single staple item of commerce can not represent a “substantial portion of the components of a patented invention where such components [plural] are uncombined so as to actively induce” for the purpose of 271(f)(1). It makes no sense given the plain language of the statute and it certainly makes no sense given the history of the statute and its well-known purpose. It’s easy to see that the holding leads to outcomes that are absurd and which simply will not be tolerated. Would you put up with those outcomes if you were an international business and other countries held you accountable for the same actions, i.e., if you shipped a generic off-patent screw from your Chinese plant to your US plant and made a device in the US that was covered by Chinese patent (but not a US patent). You think it’s reasonable for you to be held liable in China for patent infringement (assuming China puts in place a statute equivalent to the one the majority invented from scratch here)? Because you made a public domain screw and shipped it overseas? Really? I wrote: staple items of Congress. “anon” the desire of Congress to shut down any games that entities may seek to employ to escape infringement by activities on foreign shores that still reach US sovereignty by a tie to a US supplier, even a supplier of a staple good. If I’m in another country where there is no patent on a particular combination, there is no “patent infringement” to escape. The idea that Congress intended to chill the US export or import of single staple items of commerce with 271(f)(1) and 271(f)(2) is so silly that it’s hardly worth addressing except to point to the plain language of the statutes, provide one or two clear examples of the rat’s nest of “infringement” contentions that will inevitably ensue under the majority’s construction, and laugh. That silliness is the best explanation, in fact, for why the majority’s thoughtful analysis of the implications of its own holding is completely absent from the opinion. Just so we’re clear, “anon”, when your clients are asking you about the probability that this decision will become the law of the land (and not be overturned), how are you counseling them? You know my answer. And Jason’s. That’s what anon, and in fact so many other commentators seem to just ignore out of hand. Inducement to infringe was, historically, literally that. You cannot induce someone to infringe if there is no infringement occurring in that other country. Even IF congress INTENDED to make it so, it could not be so. It r impossibles. And that is the biggest problem with the decision, besides the whole staple article of commerce fiasco. “(2) Subject to the following provisions of this section, a person (other than the proprietor of the patent) also infringes a patent for an invention if, while the patent is in force and without the consent of the proprietor, he supplies or offers to supply in the United Kingdom a person other than a licensee or other person entitled to work the invention with any of the means, relating to an essential element of the invention, for putting the invention into effect when he knows, or it is obvious to a reasonable person in the circumstances, that those means are suitable for putting, and are intended to put, the invention into effect in the United Kingdom. Except for the fact that what 6 said was not ‘well said,’ you almost said something of value to the discussion of a US law that necessarily involves a nominal** foreign entity. Try reading the statute prior to commenting. Thanks. **by nominal, I do not exclude a US firm with transnational presence. But it is – and must be – that ‘foreign’ element that is performing the verb of “induce” for 271(f) to apply. As already noted, both (f)1 and (f)2 contain the language “IF such combination occurred within the United States” with the clear implication that the act being charged under 271(f) occurs outside the United States. Yes, there is an element of extraterritoriality, and that is why the law only can reach if the actor reaches into the US in engaging its supply chain here. …I would add that it appears that some are resolute in their desire not to understand just whom 271(f) is aimed at, and tend to inject their confusion by questioning whether that reach into the US supply chain (with the natural result that some foreign entities would simply NOT encumber themselves with a US supply) if such liability were to arise. Anyone who recognizes the extraterritorial impact though would (or should) also recognize that Congress had to have this reach into the US supply base in order to even pass such a law as 271(f), as without such a tether, Congress’s act would be ultra vires. It is clear that such was not only intended, but that such was necessarily intended. While we are at it, we should also put to rest the misconception that there must be a re importation back into the States for the law of 271(f) to apply. That just is not so. There is no such requirement in the law. It is just not there. Presuming you were right, which you and these folks making this interpretation today at the court are not, then the congress will have to strike the whole law when this gets in the news. Sorry bro, that ain’t gonna fly realistically or politically. Or you’re overstating “who it is aimed at”, perhaps intentionally. Or perhaps ignorantly. Either one. On its face it appears “aimed at” only those people that are essentially infringing themselves by sending everything needed to infringe overseas to do the work over there. Yet the people involved in this case only sent some random staple item. Sorry bro, not gonna happen your way ultimately. Get all hyper-textualist all you like. Nothing hypertextual at all 6 – just plain reading (and of course, an understanding of law and history does not hurt either). As to “have to strike it down,” do you have a reason for thinking this? Remember, the plain reading defeats the sense of pure extraterritoriality because of the tether to the US source. You might want to take a peek at basic standing law and the fact that a foreign entity can be subject to US jurisprudence by a number of ‘reaches’ (be it long-arm or otherwise). MM already laid it out for you. Just as I thought – you do not have one, nor can you articulate one. Right because I don’t want to repeat him “I don’t have one”. I swear to god anon, it’s this kind of instigating sht right here. No 6, it is NOT a matter of you merely repeating him – it is a matter of you realizing that you merely want to repeat someone already shown to be in error. That’s a rather important thing to take note of. O right, he was “shown to be in error”. Instigating sht. Right there. Yes 6, Malcolm has been shown to be in clear error. Note the typical lack of engagement in a dialogue and refusal to address the valid counterpoints offered for discussion. Note the retreat to the Drive-By Monologue style. Also anon fav this thread for when this decision is overturned judicially or legislatively so we can savor your sweet sweet tears. “anon” : The policy already existed, and the fallout of that policy choice remains what it is. For example, one fallout may in fact be that foreign entities do not source staple goods from the US. That is an aspect of the law – as written by Congress – that was always there. It seems reasonable to assume that if Congress made a “policy choice” that the export of single staple items of commerce (e.g., a “fastener”) could readily qualify as patent infringement when the staple item is recited in a US patent claim, I think there would have been some lengthy and serious discussion about that “policy choice” in the Congressional record. But as we both know, there was no such discussion. Furthermore, if Congress wanted to implement a “policy choice” wherein “the export of a single staple item of commerce is patent infringement if the staple item of commerce becomes a component of a product that would infringe a US patent if it were made, imported into, or sold in the US,” why wouldn’t it just say so? You know, instead of saying what it actually did say which is plainly much narrower if not the precise opposite of that. it was the policy intent of Congress to reach a foreign actor for US patent infringement based solely on that actor’s actions reaching into the US, even for staple goods, if the sum total actions of that foreign actor would constitute infringement if those foreign actions (the object of the “induce”) would meet the test of infringement if done on our shores. Then why on earth does 271(f)(2) include all that business about the item not being a staple good (in addition to other limitations)? If Congress had this “policy intent”, why did they shoot themselves in the face by limiting 271(f)(2) in that manner? I haven’t yet read the opinion, but I did read Jason’s commentary on statutory interpretation. I don’t agree with using the “ordinary legal usage” as a starting point, although it is the custom. The wording of statutes is adopted by Congress, and serves to inform the public about a policy decision that has been made by their elected representatives. The words in a statute were not intended for usage in a primarily legal context, nor were they selected by any element of the legal system. Thus, the initial starting point should always be the available dictionary meanings of the term (especially at the moment of enactment of the statute), and the next step should always be to see if the customary legal usage (if there is any) comports reasonably with one or more available dictionary meanings. Because statutes are written for the public, the possible fact that there was a legal usage that pre-dated the date of enactment should not give the legal usage any pre-eminence, unless it was already embodied in an ongoing statutory revision, or was explicitly referenced in the statutory history or record. No time to make this tight, sorry. That depends on the statute, of course. Some statutes are intended for usage in a primarily legal context. In that instance, reliance on “plain English” dictionary definitions as a first course with the presumption that the dictionary meaning controls (as opposed to the commonly understood legal meaning) doesn’t make much sense. And it seems reasonable to me (and most people — hence the custom) that longstanding legal usage of a term in a particular area (e.g., “patents”) should control in the absence of any contrary evidence. Regardless, in this particular case, it’s not necessary to ask whether a party can “induce itself” to export a single staple item of commerce overseas when the plain language of the statute excludes that activity from infringement. It’s a moot point and I wouldn’t be suprised at all if, when the decision is reversed, the construction of “induce” is left out completely. I recognize that as a normative matter folks may not prefer “ordinary legal usage.” But for purposes of statutory interpretation, when a term with an ordinary legal meaning is used, that meaning generally controls. It’s like construing a patent: it’s the ordinary meaning of a term to a person of skill in the art that matters, not the ordinary meaning to a layperson. Yes, which is why I acknowledged that it is the custom. However, you haven’t presented any compelling argument as to WHY that should be the case, nor have you responded to the argument just presented as to why that should NOT be the case. Statutes, being public laws, are obviously within the most expansive reading of the term “legal”–however, I am of the opinion that the important issue is the purpose for which a statute is written, and the intended audience. It is, broadly, a statement of policy, made in a fixed medium. That statement is made in the effort by the body that decided upon the policy, to communicate that policy to those whose behaviors, and effects thereof, are affected by said policy–namely, “the public”. It logically follows that, unless an express indication to the contrary is made (either explicitly or by reference to analogous prior legislation), the public usage should control, as it is that usage which results in the most effective and efficient communication of said policy. Absent such indication to the contrary, I see no compelling reason why prior or ex post facto statements by any adjudicative body should control the meaning of any legislative communication from the legislative branch to the public. Perhaps you could provide one, other than the settled expectations argument “that is the way it has always been done” which, although it has undeniable benefits, falls short of the alternative. Even if we – for argument’s sake – accept Prof. Rantanen’s normative views on taking the legal meaning, his conclusion is not reached for at least the following reasons. First, there is an equally plausible “legal basis” for the opposing interpretation, and secondly, he has ignored the fact that the different sections were passed (and written) by different Congresses. The majority position notes this in an oblique manner with its reference to the fact that the sections were written in different contexts. It is more than just a little bit of “assume your conclusion” to proceed as was done here in the hopes of reaching the desired uniformity of interpretation. Sure, such can be done; but such is just not the best interpretation. But let’s be clear about the boundaries of the established legal meaning canon. Ex post facto statements by either a court or legislature don’t *control* as to the meaning of a word under this canon. (Of course, since they’re canons, nothing really “controls”; all the canons need to be balanced against each other.) Rather, what matters is the pre-adoption legal meaning of the term. That’s why a better analysis would be to look at pre-1984 decisions that used the term “induce.” To give an example, Congress didn’t have the benefit of the Supreme Court’s 2007 usage of “induces” in AT&T when it passed the 1984 act. So that decision can’t possibly “control” as to the meaning that Congress had at the time. But that decision can give us a clue into the historically understood legal meaning of “induces,” just as a dictionary that writes about the meaning of a legal term might (or just as a journal article that conducts an extensive analysis of the historic meaning of the term might). The goal is to arrive at the meaning of the term that existed at the time the statute was adopted. On the other hand, under stare decisis, an ex post facto statement by a court can control as to the meaning of statute directed from the legislative branch to the public . That’s not the canon operating; that’s just how our legal system works. For example, the Supreme Court’s interpretation of “component” in AT&T as not including master disks controls whether we think that’s a correct interpretation or not. If Congress disagrees with that interpretation, it can go and change it through legislative action. But unless and until it does so, the Court’s meaning controls. That aside, would a “general purpose dictionary controls as to statutory meaning absent a contrary definition within the legislation” rule work for statutory interpretation? I’m not so convinced that it would; it didn’t work out all that well in the claim construction context, although maybe the problem there was that there were other canons of construction that interfered or maybe it was a deeper problem of conflicting ideologies about how claims should be interpreted. But maybe those other canons are important too; they help avoid absurd results, for example. Scalia and Garner actually have a section on a dictionary-heavy approach in their Reading Law book. They call it “strict constructionism.” Ultimately, if you’re looking to learn about some of the strongest arguments in favor of ordinary legal meaning, I’d suggest taking a look at Scalia and Garner’s book. They lay it out far more eloquently than I ever could; at least in part because I don’t agree with everything that they say. The language of 271(f)(1) indicates that it’s the manner in which the uncombined components [plural] (which must together constitute all or a substantial portion of the elements of the invention) are supplied that “actively induces” the infringement, as opposed to subsequent actions which might or might not subsequently take place (as I’ve already discussed, the phrase “all or a substantial portion” certainly can not be reasonably read to mean “any portion”; likewise, “components” that are “combined” can not be reasonably read to include just one component — 271(f)(2) was written to address infringement by single component scenarios). Under this interpretation, if US entity X separately supplies public domain components A, B, C, and D worldwide, it doesn’t and shouldn’t matter for the purposes of 271(f)(1) that there is a patent on the non-obvious combination of those components, nor should it matter that somebody outside the US is buying the items and practicing the US patent. The supplier is not infringing. Likewise, given the same facts, it doesn’t and shouldn’t matter for the purpose of 271(f)(1) that the supplier receives an order for components A, B, C and D and puts them all together in the same box. How can the US exporter be held liable simply for selling public domain components to an overseas entity who requests them and who is using those items to engage in perfectly legal activity? What possible policy is being promoted there? On the contrary, what plainly would matter and would qualify as supplying uncombined component[b]s [plural] in an “actively inducing” manner would be the case where the US exporter, on its own initiative, packaged the components A, B, C and D together and (1) it is clear that A, B, C and D have no use other than to be combined; or (2) the packaging includes instructions for combining A, B, C and D in a manner which results in the patented combination. Equally plain is that the fact that there are no circumstances in which the export of a single staple item of commerce, such as a generically recited polymerase, can be deemed to fall within the scope of 271(f)(1) (or 271(f)(2)). All this is to say that the entire business about “inducing oneself” is completely irrelevant to the fact that the majority butchered 271(f)(1) in other ways for reasons that are entirely unclear. Sorry Malcolm but that hypo in the third paragraph is so horribly forced as to be worthless for discussing this law. There is no relation from the so artificially strawmanned hypo to a set of facts more indicative of this case and the law’s application to this case. You go in the opposite direction of what Congress did in responding to Deepsouth and it is just not reasonably to think that the law was written with such pincite precision in closing a loophole (leaving wide open that same loophole with only minor changes in fact patterns). Malcolm but that hypo in the third paragraph is so horribly forced as to be worthless for discussing this law. Nothing at all “forced” about it. There is no relation from the so artificially strawmanned hypo to a set of facts more indicative of this case and the law’s application to this case. There’s nothing “artificial” about my hypothetical. It’s not a “strawman” but directly relevant to the statute we’re discussing and the issues surrounding it. In fact, the facts I’m discussing in my hypothetical are far more closely related to the language of the statute, the intended purpose and legislative history of the statute, and the typical application of the statute to the real world than the facts to which 271(f)(1) was so bizarrely applied in this case (i.e., the export of a single staple item of commerce). By the way, have you finished your “analysis “of the case yet, “anon”? We’re still waiting to hear whether you agree with the majority or the dissent’s reasoning and the result as applied to the facts here and, if not, why. How long do you think it will take? Again, for the moment I’m assuming you’re not mentally ill. Not an insult. Just a fact. Other adjectives that fit (if strawman makes you sad): contrived, fanciful, whimsical. Your ‘example’ covers merely a supplier (and only from the supplier mindset, even as I have pointed out – politely even – that such is not the correct mindset for this case) supplying all of the kit components. That’s right. My example of what the statute covers (when properly construed) is an example describing a supplier who supplies all of the claimed components in uncombined form because (wait for it) the statute plainly covers suppling “all” of the components (plural) where “such components (plural) are uncombined. If there’s ten components in the claim and I supply 9 of them uncombined in a single box and the missing tenth component is a staple item of Congress, then there’s a good chance I might also be infringing 271(f)(1) under the “substantial” prong. But if I supply a single component and it’s an off-patent public domain staple item of commerce? No way is that infringement under 271(f)(1). How can a single component be construed to fall within the class of “uncombined components” required by the statute without completely mangling the statute? That’s why this case is getting reversed, and pronto. You set up a situation to be knocked down. No, I didn’t set up a situation to be knocked down. I presented an example of activity that infringes 271(f)(1) when the statute is construed properly so that everyone understands what infringement under the statute looks like. The “correct mindset”? What on earth is that supposed to mean? This response is formatted correctly (finally!). “anon” Your ‘example’ covers merely a supplier supplying all of the kit components. It means not letting your single strawman example rule the straight take away meaning of the law the meaning I have clearly presented to you. Or are you still arbitrarily ig noring those canons of statutory construction that are merely inconvenient for your view? I think that you are overlooking the “causes to be supplied” part of f(1). It is not a part that you should close your eyes to. You’re wrong but thanks for your concern. Not sure why you think that I am wrong, but would be happy to hear from you how your continued obs ess ion with only an entity that is exporting (as opposed to an entity inducing the action of exporting in order to do the thing “that would infringe if done in the US“). Do you have a rational explanation for your single-mindedness when the law clearly states more than that? I certainly hope that my presumption (for the moment) that you aren’t mentally ill can be maintained. But it’s getting more difficult. Not an insult or an attack, just an observation. The more I look at this case, the more it’s clear that it needs to be taken en banc and reversed immediately. It’s that bad. Almost surely in the top ten worse Federal Circuit decisions. Maybe not as bad as State Street Bank but right up there. Is there any reason why the CAFC could not convene an en banc panel sua sponte for this case, ask for any additional briefing that might be necessary, and get rid of the holding in that way? Someting along the lines of what Rader did with product-by-process claims in Abbott v. Sandoz? I get that you think this is clear to you emotionally, but I have not yet seen a compelling legal position advanced that takes a proper vantage point of what (and whom) the law actually covers as written. I have not yet seen a compelling legal position advanced that takes a proper vantage point of what (and whom) the law actually covers as written. I have. But not from you. Be sure to use your vaunted English skills and actually list out the legal (and not emotional) position that is compelling and comports with the law as written. Make sure you address each of the valid discussion points I have added throughout the thread. You can leave out all of your emotive fluff. I think Jason provides a pretty good reason, even if you don’t agree with it, it is definitely something the Federal Circuit should consider. The law only gets better when you consider all possible positions. By doing so, you are more likely to ensure a more rational, reasonable outcome. Kind of like how having multiple circuits helps to develop different viewpoints on the law before the Supreme Court reconciles it. The end result may not be one everyone agrees with, but at least positions are advanced. Are my valid counterpoints addressed Jane, even by Prof. Rantanen (who I will note has not offered Malcolm’s emotive fluff and called it “arguments”). Lastly, I think the attempt to draw a parallel with multiple circuits backfires, given how the multiple circuit track failed to work with patent law – althought that’s a different story. I think you misunderstood. I meant that Jason has offered a compelling legal argument. That you may or may not have valid counterpoints doesn’t necessarily mean someone else’s argument is wrong. It means that we need to get the best, most well-thought argument, which considers ALL arguments (and their counterarguments). The fact that reasonable (and sometimes unreasonable) people may disagree is a good reason to take a case en banc. See my comments throughout as well as my synopsis at 15, then re-read the dissent, and then the majority’s comments regarding the dissent. I do not think the arguments presented (either in the dissent, or here by Prof. Rantanen or others) are compelling enough to warrant further judicial review. If you think that given all that I have put on the table for discussion, that en banc review is still warranted, I would welcome the additional factors that you may be able to come up with that would create that warrant. Jane, you have to remember that all of what anon considers to be a “counterpoint” will always be “valid” and simply must be addressed. Please remember that in the future. And also Jane, you simply have to remember that “it” moves. Faux intellectualism, always so funny. This was decided correctly. Why shouldn’t a corporation be able to induce itself to do something? There are different profit centers, different lawyers probably, etc. I actually don’t see any merit to the argument that a corporation can’t induce another part of itself to do something. I guess I could go through all the arguments that have been made, but seriously? There is just no merit in them. Reality: corporations are giant complex beasts. I used to work for one of the largest international corporations in the world. I think it was the largest for a while in terms of number of employees. Also, why can’t one component be enough? Of course it can if it is a non-generic component. Oh well…maybe I’ll take the time to refute all the nonsensical arguments, but this one is a no brainer. Prost is a disaster. why can’t one component be enough? Of course it can if it is a non-generic component. Nobody’s arguing that one component can’t be enough to satisfy 271(f)(2). Regardless, the single component of the claim at issue here — a polymerase enzyme described in generic terms — is a staple item of commerce. You are I are free to make such enzymes ourselves. Everybody is. And I can ship it to anybody want I want, anywhere. I don’t have to ask what they’re doing with it. That’s nobody’s business, at least as far as the patent statute is concerned. My sending to somebody else or even to myself doesn’t “actively induce” infringement because … it’s just a generic staple item of congress. It makes no sense to hold, as the majority did here, that a single staple item of commerce can represent a “substantial portion of the components of a patented invention where such components [plural] are uncombined so as to actively induce” for the purpose of 271(f)(1). It makes no sense given the plain language of the statute and it certainly makes no sense given the history of the statute and its well-known purpose. And the holding leads to outcomes that are absurd and which simply will not be tolerated. Would you put up with those outcomes if you were an international business and other countries held you accountable for the same actions, i.e., if you shipped a generic off-patent screw from your Chinese plant to your US plant and made a device in the US that was covered by Chinese patent (but not a US patent). You think it’s reasonable for you to be held liable in China for indirect infringement? Because you made a screw and shipped it oversease? Really? Sure, in the abstract. But in the context of the patent act and this statute in particular it makes no sense whatsoever. I guess I could go through all the arguments that have been made, but seriously? There is just no merit in them. Reality: corporations are giant complex beasts. This isn’t an “argument”, nor is it a rebuttal of the arguments that Jason presented, or the arguments that I presented, or that the dissent presented. As I said, Prost has the far better arguments and, at the end of the day (which we won’t be waiting long for) his view will prevail. Further, your f(1) views seem to be from the view point of the exporter as opposed to the one (the foreign one) who is perpetrating the inducement of the action abroad. There is a subtle nuance that you seem to be missing, the tie to US sovereign law may involve the exporter, but the charge of infringement goes against the entity doing the action that would infringe if done stateside. No, I didn’t “miss” that “subtle nuance”, nor does it rebut the argument I’m making. Have you decided yet whether you agree with the majority or the dissent’s holding or not, “anon”? Are you ready to explain why? Let everyone know. My views are the views of a person who is thinking about the plain language of the statute, the statutory history and purpose of the statute, and the inevitable outcomes that flow from interpreting that statute in the manner that the majority interpreted the statute. I see that that is what you are saying, but that is not what you are typing. To wit: “And I can ship it to anybody want I want, anywhere. I don’t have to ask what they’re doing with it” is NOT a proper setting for understanding this law. Yiu seen overly caught up with and are eithe confused or seeking to confuse. I am giving you the benefit of the doubt by presuming that you are missing the proper nuance. “I can ship it to anybody want I want, anywhere. I don’t have to ask what they’re doing with it” is NOT a proper setting for understanding this law. It certainly is a “proper setting” when the “it” in question is a staple item of commerce (like “a fastener” or “a polymerase”) and the Federal Circuit has completely mangled the statute, ignoring both the plain language and its purpose, without any acknowledgement of the gigantic mess it created. As to the singular nature in (f)1, I think you misread that aspect as well. “Portion” is singular and “components” being plural do not dictate that the portion item must be plural. Note the “in whole” option which speaks to the plural of all components (the entirety of the kitted collection) being only an option. “Portion” is singular and “components” being plural do not dictate that the portion item must be plural. Portion is a singular term. If it was plural it would be written “portions.” But nobody would write the statute that way. 271(f)(1) is clear on its face that uncombined components” [plural] “of the patented invention” must be supplied in or from the US in order for the statute to apply. Right here it’s plain already that the majority has made a massive error. And that’s without going into the statutory history which, as everyone knows, was a response to Deep South trying to avoid infringement by selling unassembled parts [again: plural] that had no use other than for assembling into an infringing product. 271(f)(2) is the section directed to capturing the import/export of a very narrow class of single components that “actively induce”. Let me know when you are ready to tell everyone whether you agree with the holding majority or the dissent in this case, and why. You still are in error as to the nature of the Congressional response. It was not just for entire kits with each element sold separately. It was to cover down to a single component that may be within the US sovereign (and all other components of the kit not so affected if they have no nexus with the US). Your “it’s plain already” simply is not. That’s 271(f)(2). I’m talking about 271(f)(1). There is no reasonable way to construce 271(f)(1) to cover the export of single components where those components are in the public domain. If there is a reasonable way, you have to explain it. You certainly haven’t come close to rebutting the arguments I’ve made here. It’s both f(1) and f(2). As for “rebutting” anything, you have not provided any substantive arguments to rebut. Your emotional ploys are not substantive arguments and my counters throughout the thread have not yet been answered by you. It’s both f(1) and f(2). Why would you think [that 271(f)(1) doesn’t cover the export of single components that aren’t staple items of commerce? For the reasons I’ve already articulated to you and everyone else in plain English. you have not provided any substantive arguments to rebut. Well, that’s false but if you want to pretend otherwise, go right ahead. Not an insult or anthing, but I’m going to presume for the moment that you’re failure to see the arguments isn’t a result of mental illness. I’ve no idea how a plain reading of the statute and application of well-known accepted rules of statutory construction could possible be considered an “emotional ploy.” Explain that to everyone. Explain it directly to Jason because he’s doing a very similar analysis (identical in some particulars) and he reaches the same conclusions that I do about this case. Go ahead and tell Jason that he’s engaging in “emotional ploys” without substance. Tell him that over and over again, every day, ten times a day. Then Jason might begin to understand why some people believe you have a mental illness (that’s not an insult — just a fact about their beliefs; for the moment I’m presuming that you aren’t mentally ill). If you spent half the time giving me a straight answer instead of dodging, that you spend whining about my asking you to acknowledge what is in the law, Malcolm, we could get to moving on here. If you cannot account for the point of law I provide, merely state so, instead of attempting to kick up so much dust, and then attempting to sling mud at others. “anon” attempting to kick up so much dust, and then attempting to sling mud at others. I’m not attempting to “kick up dust.” It’s odd that you would say so. And I’m not attempting to sling mud at others. I’m just noting that, for the moment, I’m presuming that you are not mentally ill. It’s not an insult or an attack. Certainly no more than you’re accusation that I’m trying to “kick up dust” is an insult or attack. I notice you didn’t respond to the different profit centers corporations have. That alone is enough to break the need for a third party. >Sure, in the abstract. But in the context of the patent act and this statute in particular it makes no sense whatsoever. I do not share your “per se” view of corporate citizenship as necessarily offensive. On the other hand, I definitely do not think that such corporate citizenship is or should be taken (especially in patent law) to be held at the same level of esteem as an individual. I think our constitution and the notion that the inventor must be in the very first instance an actual person precludes that level of “equality” (even after the AIA changes – and in fact, especially because of the way the AIA changes “were sold”). Your notion of care and concern (i.e. trusts) remains a valid notion, and I would magnify that concern a quantum level for corporations that are international in nature (Big Corp). Such entities are in fact almost equivalent to “gypsy” like city-states based in their accumulated power and the lack of any true loyalty to a single sovereign (as would an actual person have). It simply is far too dangerous to innovation itself to vest the power of the natural citizen to a legal entity for whom the benefit of degradating the power of the patent is such an obvious conflict of interest. It is one thing to accord a (single?) legal voice, it is quite another to ignore the power and possible corruptive influence and the obvious conflict of interest of such landed, and large scale established entities who face the most to lose from disruptive innovation. Did Malcolm misstate what you posted by switching gears to f(2)? One thing I find confusing about this case is why the Court had to reach the issue of whether a party can induce itself to infringe under 271(f). The opinions seem to acknowledge that Life’s UK subsidiary–which is a different corporate entity than the defendant Life Technologies, Inc.–was the entity the combined the components in an infringing manner. Absent veil piercing, alter ego, or some other exception, shouldn’t these two companies be viewed as separate entities? And, if that is true, then the defendant really was inducing “another” after all. If you want some real ammo for how to interpret the induces statute simply look to the history of how there even came to be such a thing as inducing infringement, even prior to the statute. I think it is incorrect to say that the majority’s interpretation renders 271(f)(2) superfluous. Not every component “especially made or especially adapted” for an infringing product is an important or essential component. To take a simple example, a car manufacturer may have a unique size and shape for its battery–the battery would have no other use than for that model of car. But a battery is not an important or essential component to a car (granted, it is “essential” in the minimalist sense that without the battery the car won’t run, but that is not the sense that I understand the majority to be using the term, and I can even imagine other examples, such as wiper blades, that aren’t but-for requirements of running the car). I’m not following you, TJ. If the unique size and shape of the battery is not driven by the claim, but only by the manufacturer’s requirements, then I don’t think you’d have contributory infringement either, even if the final product was infringing. If, on the other hand, the unique size and shape of the battery is driven by the claim, then it would seem to be an “important” or “essential” element of the invention. I think it’s confusing to talk about whether it’s important to the car – the question is whether it’s important to the claimed invention. At least textually, 271(f)(2) has no such equivalent provision. It is an interesting issue whether 271(f)(2) should nonetheless be read to implicitly have a materiality requirement, since without it there seems to be some potential for odd results (e.g. an airplane seat would seem to have no use outside of an airplane, but it seems odd to hold a seat manufacturer liable for infringing a patent on an airplane by exporting the seat (and of course I realize that no one has a broad patent on “the airplane” or “the automobile” today, but I’m using the example to illustrate the point)). The issue has never been judicially decided to my knowledge. But Jason’s argument was that the majority’s holding renders the “especially made or especially adapted” part of 271(f)(2) superfluous, and my response to that point was that something can be especially made or especially adapted for use in a patented invention without it being really all that important or essential to the patented invention. So that I understand your position TJ, here’s what I think you’re saying – correct me if I’m misunderstanding: Assume Z has a patent on a vehicle that contains the limitations of four wheels, an engine, and a chassis. X manufactures seats whose sole purpose is to fit into vehicles with four wheels, an engine and a chassis. You don’t need a seat to operate the vehicle (although it’s pretty uncomfortable), but there’s no purpose for these seats other than to be used in the patented vehicle. If X were to supply such seats with the intent that they would be combined with the other elements to make a vehicle with a seat, X would be liable under 271(f)(2). Your materiality point is very interesting and does indeed seem to possibly lead to some weird results. I haven’t looked at this question for a long time. Do you recall whether the “constituting a material part of the invention” has ever been applied as a meaningful limitation in 271(c)? Jason, you understood me correctly. Now if I understand you, you are making the argument that I attributed to MM below, namely that a “component of a patented invention” must be something that is claimed. So a seat isn’t a component of the patented invention in the Z patent on an automobile, because the claim does not recite seats. I’m skeptical that a component of the patented invention must be a recited element in the claim. Take AT&T v. Microsoft, which I think is the only Supreme Court case dealing with the issue of what constitutes a component under 271(f). The claim in AT&T’s patent was to a speech processing computer. It didn’t mention anything about a storage medium or CD-Rom disk (it is full of means plus function elements, but at first glance I don’t think any of them read on the CD itself). But the implicit assumption that runs throughout the S.Ct. opinion is that the CDs were components. 1. An apparatus comprising four wheels, an engine and a chassis. 2. The apparatus according to claim 1, further comprising seats. I don’t follow that at all, TJ. Dependent claims implicitly “recite” all the elements of the independent claim from which they depend. My point is that, under your theory of what constitutes a “component of the patented invention,” the seats would be considered components for claim 2 but not claim 1. And since 271(c) and (f) liability is triggered by selling components, that would make it possible to be liable for claim 2 without being liable for claim 1. TJ, I’m not following you on this either. I think you’re drawing on the general rule is that an activity that infringes a dependent claim also infringes the claim from which it depends. But this is a rule of 271(a) direct infringement, not contributory infringement. It’s perfectly logical for someone to contributorily infringe a dependent claim but not an independent claim. That’s because the indirect infringer is not itself satisfying the claim limitations, but rather is simply providing a component for that infringement. In the case of a dependent claim, it may be that the component that’s being provided is the additional element provided in the dependent claim. Consider our vehicle example, but with a dependent claim specifying the addition of a steering wheel. Assume that steering wheels are new (no one had cars before, so no one needed steering wheels). If X supplies steering wheels to Y, with the knowledge that they would be combined with the chassis, wheels, and engine to form the claimed vehicle, X would be liable for contributorily infringing the dependent claim. But because X did not provide any components of the independent claim (chassis, wheels, or engine), X would not be contributorily liable for infringing that claim. Are you assuming that (f) must be only contributory infringement? Jason, I am aware of no case where someone has been found to be contributorily liable for indirect infringement of a dependent claim but not liable for infringement of the independent claim. Do you have a cite handy? But they do at least have to be ingredients for the claimed invention. In other words, a piece of metal that is then cut and welded to form the chassis of our hypothetical vehicle is a “component.” But a piece of metal that is cut and welded to form a part of the car that is not a claimed element; that’s not a component of the patented invention. The Windows disks could be components because they were an ingredient in the claimed elements. But a seat, or a custom gearshift, would not be “a component of” the patented vehicle because neither is an ingredient of the claimed invention. This seems consistent with footnote 11 of AT&T (“Component” is commonly defined as “a constituent part,” “element,” or “ingredient.” Webster’s Third New International Dictionary of the English Language 466 (1981).”). Please be careful about wandering too far into the weeds here. That piece of unformed metal is arguably a “component”in plain English, Jason, but it’s never going to be a “component” of “a patented invention” within the meaning of 271(f)(1) and or within 271(f)(2). And that’s precisely because (in the first instance) it’s not an element of the patented invention and (in the second instance) because it’s a “staple article” and/or it has substantial non-infringing uses in the second instance. It also helps to step back. If I’m a manufacturer in the UK and I want to make a refined metal object that is covered by a US patent, it doesn’t matter that I get my unformed staple metal “ingredient” from the United States. It also doesn’t matter if I ask my friend in Pittsburgh to ship that unformed metal to me and it doesn’t matter if I go to the US and “induce myself” to find or make the unformed metal and ship it to myself so it’s there when I return to the UK. There’s no liability for patent infringement there. There simply can’t be liability without creating a massive nest of ridiculous liability for every foreign company that uses US goods in the creation of its products. Looking at your hypo, I do not see how the blanket statement of the UK manufacturer having no liability stands, given that section f does in fact create liability for actions that culminate overseas, but does have a nexus with US suppliers (by which the soveriegnty flows). Sure, other factors need to be met, but the blanket statement does not reach (and no, the “massive nest of ridiculous liability” is not a factor at all. Such is completely immaterial to the law as written by Congress. I never made such a blanket statement. Indeed they do. Those factors are addressed in my comment. he “massive nest of ridiculous liability” is not a factor at all. I never said that it was. The “massive nest of ridiculous liability” results when those factors — which I have discussed ad nauseum in this thread — are read out of the statute. Such is completely immaterial to the law as written by Congress. You’re quite wrong. I’m 100% certain that Congress was not interested in creating a massive nest of liability for US manufactur/exporters of staple ingredients. Hence, those “other factors” you referred to (which I’ve addressed in this thread ad nauseum). Do you agree with the holding in this case and the intepretation of the key terms “induce” and “substantial” by the majority or the dissent? If not, why not? Your blanket statement – without the other comments – was made in the comment to which I responded to. I did not respond as such to the comments that you did not make a blanket statement. This comment did not indicate at all that it went hand in hand with your other comments. So yes, you did make such a comment, and the other factors are indeed missing from the comment that I responded to. In fact, the only other portion of the comment that I responded to that was a possible factor was the thing you said (but deny ever saying). It is most odd that you attempt to deny what is plainly in black and white. If you had meant to say something else, you should just admit such. As for the holding and the interpretation of the phrases, I have not yet finalized my opinion. I will say though that Prof. Rantanen seems to have skipped over a discussion point regarding inducement in legal contexts not necessarily involving another, as well as breezes by too quickly the object of the sentence as to what ‘induce’ attaches to (it is an action and not a person that is induced, which does lead one towards the particular meaning of ’cause’). As for the holding and the interpretation of the phrases, I have not yet finalized my opinion. Let us know when you finish your analysis. My analysis and Jason’s analysis is on the table, along with several others. I don’t think this decision will take long to render null and void. I’m not fully sure about the contours of the “ingredient” test you are outlining. In what sense, precisely, are the Windows CDs in AT&T ingredients for the patent claim. The CDs themselves are not a means for processing speech. And if what you mean is that a computer with the CD in the drive (and the software loaded into memory) becomes a means for processing speech, and the CD is therefore an ingredient of the computer, then at that point I think your ingredient test is just a word game of finding the biggest “lump of material” in the claim to stuff the accused product into. For example, if the claim to the car said “body” instead of “chassis,” then I’d argue that the seats are ingredients for the body, and I doubt you would have ex ante thought it important whether the claim said “body” or “chassis.” And even if you are going to stick to saying that the body-vs-chassis wording should matter, to take it to the extreme, one claim limitation in our car claim is that it is an “apparatus,” and the seats are an ingredient for that apparatus. I will suggest you not get too caught up over some case involving CD’s TJ. Especially since, as you pointed out below, you’re going on an assumption that runs throughout the case. It may be that the defendant never brought the point up and argued about it. That may be because the defendant themselves would like the assumption to be made in other cases where they are the plaintiff. And if there is no conflict between the parties, the USSC or any other court is unlikely to manufacture one. That sort of thing happens a lot in compooter cases nowadays in the patent field. TJ: I’m not fully sure about the contours of the “ingredient” test you are outlining. In what sense, precisely, are the Windows CDs in AT&T ingredients for the patent claim. I don’t agree with Jason’s “ingredients” analysis either, for reasons I mentioned. I think he’s just trying to help you understand that 271(f)(1) and 271(f)(2), on their faces (not to mention the statutory history underying them), are focused on the claimed invention and the elements/components that are combined to meet the limitations of the claim. They can’t possibly be construed to reach the nearly infinite number of staple components (and staple sub-components) that are not expressly recited in the claim without turning the statute into a horrific infringement trap for every individual or business exporting staple items oversease. I also AT&T as an interpretation guide for this issue is a mistake for the reasons I’ve already mentioned. The issue wasn’t briefed and it wasn’t briefed because of the strange factual posture of that case (and I say “strange” because software presents issues that tangible objects such as polymerases do not present). That said, I think the simple answer to your question would be that the CDs in AT&T would be “ingredients” for the claimed invention because the CDs held the “means” (i..e., the software) that are recited in the claims, in much the same way that a jar or a baggie holds the spice “ingredient” that is recited in a recipe. IMHO, most of the majority’s opinion in AT&T isn’t worth the paper it’s written on (other than its recognition that software is intangible instructions). But it goes without saying that neither the public domain polymerase in this case nor the foreign-made kit incorporating that polymerase that is never imported has pretty much nothing in common with the allegedly novel and non-obvious CDs that were exported in AT&T or the computers that were imported back into the US. I can give you an example of a biotech-related scenario which would be much, much closer to the AT&T scenario but still wouldn’t (absent this soon-to-be-voided holding) constitute infringement under 271(f)(1) or 271(f)(2): the hypothetical export by Promega of a piece of paper with instructions on it telling someone how to make the polymerase. It’s frightening to think what the majority in this case would do if they got their hands on that fact pattern! I don’t agree with Jason’s “ingredients” analysis either, for the reasons I already provided. I think he’s just trying to help you understand that 271(f)(1) and 271(f)(2), on their faces (not to mention the statutory history underying them), are focused on the claimed invention and the elements/components that are combined to meet the limitations of the claim. They can’t possibly be construed to reach the nearly infinite number of staple components (and staple sub-components) that are not expressly recited in the claim without turning the statute into an enormous infringement trap for every individual or business exporting staple items overseas. I also think, TJ, that AT&T is very poor statutory interpretation guide for the particular issues we’re discussing for the reasons I’ve already mentioned. Namely, the issue wasn’t briefed and it wasn’t briefed because of the odd factual posture of that case (and I say “odd” because software presents issues that tangible objects such as polymerases do not present). That said, I think the simple answer to your question re “ingredients” would be that the CDs in AT&T would be “ingredients” for the claimed invention (according to Jason’s off-the-cuff theory) because the CDs held the “means” (i..e., the software) that was, in fact, recited in the claimed invention, in much the same way that a jar or a baggie would carry the spice “ingredient” that is recited in a recipe. I also think, TJ, that AT&T is a worse-than-imperfect statutory interpretation guide for the specific issues we’re discussing, for the reasons I’ve already mentioned. Namely, the issue wasn’t briefed and it wasn’t briefed because of the particular and unique factual posture of that case (most especially the fact that claiming software presents issues that tangible objects such as polymerases do not present). Lastly, TJ, I think the simple answer to your question re “ingredients” would be that the CDs in AT&T would be “ingredients” for the claimed invention (according to Jason’s off-the-cuff theory) because the CDs held the “means” (i..e., the software) that was, in fact, recited in the claimed invention, in much the same way that a jar would carry an ingredient to be combined with others in a recipe. TJ: [AT&T] didn’t mention anything about a storage medium or CD-Rom disk (it is full of means plus function elements, but at first glance I don’t think any of them read on the CD itself). But the implicit assumption that runs throughout the S.Ct. opinion is that the CDs were components. Your mileage may vary, of course, but I have zero doubt about where we all end up. If an item – as a component of the invention must be within the claim, then the part of the phrase “or especially adapted” loses its meaning. One does not have to ‘adapt’ something if that something is already a part of the named claim. The only reasonable take away is that something outside of the named claim – as long as that something is not a staple of commerce – can lead to patent infringement (and yes, this end result of patent infringement can be done by a foreigner in a foreign land based soley on that foreigner’s sourcing of the non-staple item from the US, if such meets the “substantial” screen, and the rest of section (f)). “anon” if an item – as a component of the invention must be within the claim, then the part of the phrase “or especially adapted” loses its meaning. I don’t think so at all. The phrase has pretty much the same meaning as “made for use in.” I think the presumption against surplusage that you appear to be invoking is trumped by the plain meaning of “component of the patented invention”. so we have some clue as to what you are contemplating when you talk about “a component of a patented invention” that is “outside of the named claim.” Specifically, give us an extreme (i.e., “on the bleeding edge”) example (one for each of the two classes listed above) of such “components of a patented invention” which are “outside of the named claim” and whose export would result in infringement under 271(f)(2). Don’t worry about finding the most extreme example. Just take a minute or two and think about it and give us the examples that pop into your head. On the flip side of the coin, if you want to ignore the plain meaning of “component of the patented invention” and construe “especially adapted for use in” as allowing a non-recited non-staple component to get roped in by the statute, it’s very easy to identify examples of infringement of 271(f)(2) that would shock the conscience of any reasonable patent attorney. Consider, for example, the situation where X has a US patent (and a US patent only; it’s off-patent in Canada) on a recombinant enzyme for making human hair. I buy some of the enzyme and I develop a separate and new co-factor that is “especially adapted for use” with the patented invention. It has no other use other than to enhance the patented invention (not a staple item of commerce). Under your interpretation of 271(f)(2), if I send some of that co-factor — a completely different protein from the enzyme, in case it isn’t clear — to my brother in Canada who plans to use it with the enzyme he purchased in Canada, am I an infringer of 271(f)(2)? After you answer that, then consider if/how the result changes when I send to Canada my cofactor already combined with the patented protein. Remember that I purchased the patented protein. And remember also that 271(f)(2) requires that the exported and “especially adapted” article also be “uncombined in whole or in part”. The “generic” question you are asking is not the “correct” question under the majority’s 271(f)(1) analysis. The “correct” question (according to the majority) is: is the imported/exported component an important or essential component of the claimed invention? I agree with Jason. I can’t think of an instance where a component that is “especially made or adapted” for a particularly claimed invention is not going to also be an “important/essentiall” component of that same invention. MM, if your argument is that (1) a “component of a patented invention” must be something that is claimed, and (2) anything that is claimed is by definition important or essential to the patented invention, then the conclusion follows. But I’m not sure either of those propositions is necessarily correct. I’m more skeptical of the first proposition. A claim to a car–e.g. “a surface transportation device comprising an engine mounted on a body adjoined to at least three wheels”–might not recite a battery or even a steering wheel, but I’d submit that a steering wheel is a component of the patented invention, and that it is especially made for use in a surface transportation device that has an engine mounted on a body and at least three wheels. I also have reservations about the second proposition. To be sure, the first rule one teaches about claim drafting is “do not include anything that is not essential”. But just because the rule is taught does not mean it is invariably followed. TJ- think about the consequences of your interpretation of “component of a patented invention” when applied to the almost identical language in 271(f)(1) (“components of a patented invention”): It would make even the supplier of a staple article of commerce liable if it intended for that article to be combined with a patented invention abroad. For example, an airplane manufacturer would be liable if it purchased standard bolts in the United States to be used in connection with an airplane body that was constructed and located in Germany even if the patent only covered the airplane body itself. (Clarification: unlike the situation in Promega, in my hypothetical bolts are *not* an element of the claimed invention.) That seems like an absurd result. More generally, I don’t see how “any component of a patented invention” can bear the meaning that you’re giving it. That language has been consistently interpreted as referring to an element of the claimed invention, not simply something that is used in connection with the claimed invention. See, e.g. Microsoft v. AT&T Corp, 550 U.S. 437 (2007) (“Section 271(f) applies to the supply abroad of the “components of a patented invention, where such components are uncombined in whole or in part, in such manner as to actively induce the combination of such components.” § 271(f)(1) (emphasis added). The provision thus applies only to “such components” as are combined to form the “patented invention” at issue.”). The Court specifically quoted the language of 271(f)(1), but it was discussing the meaning of “components” for all of 271(f). Not true. 271(f)(1) requires supplying “all or a substantial portion of the components” from the United States. The bolts supplied from the US in your hypo are not “all” of the airplane, and even under the majority’s reading they do not constitute a “substantial portion” of the airplane. TJ: under the majority’s reading they do not constitute a “substantial portion” of the airplane. portion of the components” of a patented invention. Even in the claims at issue in the instant case, the polymerase is just one component out of potentially thousands of others. In fact, the number of polymerase molecules in the kit is going to be dwarfed by the number of unpatentable triphosphate molecules and the unpatentable buffer molecules. But they’re all incredibly “important.” Just like bolts are “important” to Jason’s airplane. If we include non-recited elements (which I think must certainly be excluded from 271 for the reasons provided), the number of compositions that are arguably “important” for the manufacture of Promega’s kit is very large indeed. Who knows how many of them are made in the US and exported for use in non-exported foreign manufactures that would “infringe if they were made in the US”? It’s impossible to figure out. TJ (if your argument 1) a “component of a patented invention” must be something that is claimed, and (2) anything that is claimed is by definition important or essential to the patented invention, then the conclusion follows. But I’m not sure either of those propositions is necessarily correct. The component must certainly be recited in the claim or else it wouldn’t be a “component of the patented invention” as both 271(f)(1) and 271(f)(2) requires. Or a radio tuner knob. And that’s why I can not only get my own patent on a separate steering wheel or battery or tuner knob for your car, but I can also make and sell them freely without worrying about infringing your car patent — that’s a substantial non-infringing use and right there I’m out of 271(f)(2). How can it be otherwise without creating a completely new and never-bef0re-contemplated vision of what constitutes patent infringement? To be sure, the first rule one teaches about claim drafting is “do not include anything that is not essential”. And that’s because infringement of a patent requires meeting all the elements recited in the patent. I suppose reasonable people can disagree about fuzziness around 271(f) but it was never intended to turn people who are making non-recited add-on components of claimed inventions into infringers, nor was it intended to turn people who are making single public domain articles that are staples of commerce into infringers. You’d have to work really hard and ignore a lot of history and the plain language of the statute — like the majority did here — to try to make that happen. I’m not so sure about TJ’s battery example, but the gear-shift knob in my Maserati Ghibli is made/adapted for that car but it is not essential. A knob made/adapted for a VW would work fine. Or no knob at all, but without a knob the stick could tear my kid-skin gloves. There is no logical or necessary requirement that every component that is specifically made and/or adapted for a machine or device be important or essential for either function or patentability. If there was, there would be a lot fewer dependent claims seen’ hows the parent claim must claim a functional invention and deferring an essential element to a dependent would render the invention claimed by the parent non-functional. You know this case brings up something interesting to my mind. I have worked on automating mechanical machines. And, one of the big concerns of the manufacturer is upgrade kits that can be sold to turn old machines into the new automated machines. And, guess what? The only new part is —–software. That’s right. I have claims to kits, but all the parts can be purchased elsewhere but the controller. And I should add this is an international corporation and the automation of the machines is a billion dollar business. The global status of a company and the size of its business are irrelevant to the statute we are discussing. The size of the business is also relevant because it goes to whether there will be a motive and the likelihood of a problem and the amount of money the company is willing to spend to try and prevent a problem. Sheesh. Please apologize for your comment MM. That’s true in every business context. I assumed that your comment — which you went out of your way to make as an addendum to your first comment — had something specifically to do with the case we’re discussing in this thread. Speaking of that case, do you agree or disagree with the holding and/or the reasoning of the either the majority or the dissent with respect to the “inducement” and “substantial component” issues? That is an interesting issue, Night. I think there is at least one case that is relevant: Microsoft v. AT&T, 550 U.S. 437 (2007). This is the one where the Supreme Court said that software is not a component, at least for the purposes of 271(f). That’s a bit of a gross overstatement of a much more subtle holding. That’s fair. The court actually distinguished between software “in the abstract” and a computer-readable medium that included software on it, and held that the former was not a component, for 271(f) purposes. It’s too bad they didn’t address the issue of whether computer-readable medium claims are valid claims under 35 USC 101 (alas, I’m sure this wasn’t part of the issues to be resolved, but the CAFC needs to clarify this sometime). The question is way off-topic from this thread but, given Bilski/Prometheus/Alice, we know that such claims are certainly not per se eligible under 101. From Prometheus/Alice we can also be certain that a medium reciting otherwise ineligible data (e.g., an old computer readable medium comprising data encoding a new non-obvious recipe for making cookies) is also ineligible. I could go on. Suffice it to say, such claims are on shaky ground to say the very least. I wouldn’t spend any money on them. I am aware of that case. Jason: As a policy matter, the court’s decision pushes those [foreign companies towards one of two alternatives: purchasing their components from another (possibly US) supplier or simply making the components abroad. Assuming this decision has a snowball’s chance in heck of surviving further review (which I highly doubt), I’m not sure I see why, e.g., the defendant here would avoid liability by shifting its source of polymerase to another US manufacturer. Given the ridiculous interpretation of “substantial portion” in this case, why wouldn’t that manufcturere now be guilty of inducement? The intent — assistance in the making of a product overseas that would infringe if it was made in the US — is the same. Regardless, if folks are concerned about patent decisions that could impact US jobs, look no further than this silly and completely avoidable debacle. Because the facts here might seem overly “technical” to people outside of the field, an analogy might be useful. Let’s say X has a US patent on a non-obvious wagon. One of the essential components of the wagon is, of course, a wheel. The wheel itself is old and in the public domain. Y has a manufacturing plant in the US which makes this exact wheel (it’s been doing so for a long time – long before X’s patent was filed). It ships them around the world. Y also has a manufacturing plant in France which makes wagons. Because X has no wagon patent in France, Y decides to make the wagon described in X’s patent and sell the wagon to French people. For that purpose, Y uses the wheels it has been making in the US since forever. According to this decision, Y’s manufacturing and export of an unpatented wheel is suddenly an infringing act. That’s just plain crazy. Did the majority stop and think for two seconds about what they were doing here? You forgot one small and important (albeit possibly outside the traditional sovereign reach) factor: the entity is knowingly using that ‘traditional’ item in a manner that would be infringing if done in the States. he entity is knowingly using that ‘traditional’ item in a manner that would be infringing if done in the States. So what? That happens all the time. It’s called “freely making and selling a kit in a country where there is no patent on the kit.” People in the US do this all the time. Should I care if my the kit that I make and sell in the US is covered by some Chinese patent? Of course not. Does it matter that some off-patent, public domain component in my kit is made in China? Of course not. Where did you come up with the word “traditional”, by the way? Try “public domain” and “unpatentable”. As in “everyone has the right to make and use and sell it”. I don’t think that such a factor (right or wrong) should be glossed over. Sure they are. They are making public domain wheels in the US and using them to manufacture and sell unpatented articles in their own country. These are parts of the law that cannot be glossed over, with ‘policy’ that should not have eyes closed to. Why would people outside this field read this blog, the comments to the blog, and this entry in the blog in particular? Who reads legal analysis of this type other than lawyers? I was talking about the biotechnology field. I read it. I’m not a lawyer. I try to understand what affects my world and my job. I may not be an expert, but I know more than the people that watch CNN or FOX for their information. With all due respect, I side with Judge Chen, but with perhaps some additional explanation as to how Section 271(f) changes the traditional U.S. concept that infringement liability requires at least one act of direct infringement. In particular, viewing “active inducement” under Section 271(f)(1) through the lens of Section 271(b) and its case law is not the way to go. Instead, I suggest you consider the 2001 Federal Circuit case of Waymark Corp. v. Porta Systems Corp., 245 F.3d 1364. While Waymark specifically addresses and interprets Section 271(f)(2), that case also specifically points out that Congress, in enacting Section 271(f), altered the traditional U.S. concept by not requiring any proof that direct infringement has occurred to support infringement liability. That view also applies to Section 271(f)(1) which only requires the “active inducement,” not the completed (direct) act of infringement. In particular, the view of Section 271(f) taken by Waymark completely avoids the “extraterritorial reach” issue of Deepsouth Packing, something that SCOTUS completely blipped over in AT&T v. Microsoft. I agree that 271(f) is different from 271(b) and (c); in particular, 271(f)(1) and (2) is actually a direct infringement statute because it is the “suppl[y]” component that is the basis for the liability, not the actual combination of the elements. And I see your point on extraterritorial application and how the “no requirement of actual combination” helps get around this. That said, regardless of whether 271(f)(1) contains a requirement of actual combination,* we’re still dealing with the interpretation of a particular term in that statute: “induce.” Congress did not just reach into a dictionary and pull that word out. It’s a word with an established legal meaning and in interpreting it we can’t just start with a general purpose dictionary. Instead, we need to look at, among other things, the closest parallel statute that also contains that word, which is 271(b). It’s not that the Court has already construed “induce” in 271(b) and thus we must, by operation of precedent, mechanically apply that interpretation to 271(f)(1). Rather, it’s that this word has an established legal meaning, as shown by 271(b), and it must be interpreted consistent with that meaning in 271(f)(1). *On this point, I can see an argument that Waymark is at least questionable following Akamai. OK, I now see where you’re going which is truly problematical about Chen’s opinion: the meaning of “substantial proportion of the components.” Certainly the Taq enzyme was important but so were the other components (several other in that respect) in that kit. In that regard, shipping just the Taq enzyme to the UK is in no way analogous to the situation in Deepsouth Packing which is what Section 271(f)(1) is all about. EG: shipping just the Taq enzyme to the UK is in no way analogous to the situation in Deepsouth Packing which is what Section 271(f)(1) is all about. No doubt. The majority here simply worked backward from the result it wanted to reach: liability for kits made in UK using one imported component (the polymerase) where those kits were never exported into the US. Try to imagine how US manufacturers and retailers of off-patent multi-component kits would react if they were suddenly liable for infringement only because (1) their kit is patented in China, where the US company doesn’t export; (2) their kit included some off-patent part that was made in China. That’s what happened to the defendant here. Happens a lot – sometimes such is even actively advocated. And yes, I agree with you that such a judicial reach, even if for some ‘policy’ motive is somehow deemed a desired end, the manner of the means to that end requires critical review. I don’t see any rational “policy motive” here unless unadulterated, unchecked patent love is a “policy”. Either that or it’s just the majority’s immature attempt to get a few more slaps at Mr. Reines. I do not understand what you mean by “unadulterated, unchecked patent love” but since Congress did act as mentioned elsewhere in the comments today, your ability to see, much less define “rational” has very little weight. This is not an attack, nor even an insult. But if you want to pretend there is no underlying policy driving the issue, then your view apparently lacks the necessary vision to add much of anything to the conversation. MM: Anon’s last comment was certainly close to the line, but I let it slide since it was not particularly abusive and was at least somewhat relevant to the topic. Your subsequent comments, however, were not even close to the line. When I moderated your first comment, which contained highly abusive language, you responded with more abusive language and double posted the exact same comment at the top of the thread. I’m not going to go through comments line by line and delete just the abusive stuff; I’m simply going to remove them entirely. Why do you think that is, Jason? Coincidence? That’s a serious question. Why do you think that pretty much ever other comment that “anon” makes in response to my comments (and the comments of anyone else he disagrees with) is “certainly close to the line”? Any thoughts on that, Jason? Because this is the same “anon” that will inevitably tell everyone (either on this thread or on another thread) that my behavior is no different from his. And then his pal NWPA will high-five him by piling on. Will that inevitable comment “also be close to the line and not particularly abusive”? After all, you and everyone else can read the comments I made here regarding this case and responding to others who commented on the case. What about a comment that takes something I said and completely twists it around into something that is the OPPOSITE of what I said and then attacks that comment in a “close to the line” manner? How about that? “Abusive”? Or how about simply making something up that never happened (“you called me a N-“) or “you refuse to address [insert issue that’s been directly address 1000 times here]”? Because that happens every day as well. This is the ongoing problem, Jason. I’m trying to work with you moderators and I’ve been working with you moderators. I’m not initiating personal attacks on commenters who aren’t flinging at me first, even when they’ve flung everything at me in the past. But it’s ridiculous to force me and others (I’m far from the only one) to have to put up with it day in and day out. By encouraging this endless daily “close to the line” baloney from the same two people I’m afraid you are only making the problem that much worse. Thanks for listening and I apologize for getting peed off but, frankly, I think you’d feel the same way if I came after you twenty times a day in the same manner. I’ll be clear here: Abusive posting includes using swear words, bodily parts, bodily functions and/or a combination of the three to refer to another person. If you or anyone else does that, I’m going to remove the post. You did that in those posts; I removed them. You guys start taking subtle jabs at each other? I’ll allow them, as long as they don’t get too out of hand, excessive, or off topic. I’m not going to try and police every snide comment that folks make. But somehow if the defendant makes this public domain polymerase at its US manufacturing plant, then exports that polymerase to the UK for its own use in the creation of kits that are never imported back the US, those un-imported kits still create infringement liability … of a US patent??? The result would be just as upsetting to you under the proper interpretation though, the point of the law is to reach exactly what you think it doesn’t – to forclose from US citizens the creation of the patented item even in a foreign land where a national of the other country would be able to make it. the point of the law is to reach exactly what you think it doesn’t – to forclose from US citizens the creation of the patented item even in a foreign land where a national of the other country would be able to make it. I don’t think that’s the point of the law at all, RG. The point of the law is to prevent the sale in the US (or importation into the US) of an unassembled apparatus that, when assembled, yields a patented invention. This statute was enacted in direct response to a case (Deepsouth Packing v. Laitram) where the Supreme Court said that manufacturer could do exactly that, under the old law. The point of the law is to prevent the sale in the US (or importation into the US) of an unassembled apparatus that, when assembled, yields a patented invention. The language on its face is inducement to combine outside of the US, and while there is debate about “inducement” nobody doubts that the focus is reaching a combination OUTSIDE of the US. This statute was enacted in direct response to a case (Deepsouth Packing v. Laitram) where the Supreme Court said that manufacturer could do exactly that, under the old law. In other words, 271(f) is designed to prevent the violation of the “making” or “sale” negative rights in the US by “essentially making” it in the US but leaving only token acts (i.e. the final combination) outside the US. The intent is exactly what MM thought was crazy (who I meant to reply to at 1) – rather than his bolded language being “strange” to him, that was precisely what Congress intended to cover. What I point out in 2 below is that 271 does not require the actual combination occur, and thus the patent power doesn’t reach to it. I think it would be unconstitutional but for the fact that the commerce clause can also curtail the action (because “supply” as properly interpreted means an exchange between two entities). But when you interpret the statute in a manner that no commercial transaction need take place, you just have Congress attempting to control your personal property outside the US, and they lack jurisdiction to do so. The court’s interpretation renders the statute an unconstitutional overreach. There MUST be a commercial transfer that triggers commerce clause power for the statute to be valid. I’m not sure what we’re arguing about, RG. I agree completely with your statement: “In other words, 271(f) is designed to prevent the violation of the “making” or “sale” negative rights in the US by “essentially making” it in the US but leaving only token acts (i.e. the final combination) outside the US.” That’s a clearer version of my comment that the “point of the law is to prevent the sale in the US (or importation into the US) of an unassembled apparatus that, when assembled, yields a patented invention.” My point was that the statute reaches (as it must) only activities in the US. It has nothing to do with whether you’re a US citizen or not, and it can’t reach activities that are only carried out abroad. I think that’s a very interesting argument. It hinges, of course, on your initial premise that the patent clause doesn’t permit Congress to prohibit the sale of unassembled, but otherwise complete, inventions. That might be debatable, but I like your analysis. It hinges, of course, on your initial premise that the patent clause doesn’t permit Congress to prohibit the sale of unassembled, but otherwise complete, inventions. In other words, were your reading of the power given it’s full weight the commerce clause would be superfluous, since the right to regulate parts of a patent would constitute not just all interstate commerce, but all intrastate commerce as well. I doubt there isn’t anything that isn’t a part of a patent somewhere. RG: 271(f) is designed to prevent the violation of the “making” or “sale” negative rights in the US by “essentially making” it in the US but leaving only token acts (i.e. the final combination) outside the US. The intent is exactly what MM thought was crazy (who I meant to reply to at 1) – rather than his bolded language being “strange” to him, that was precisely what Congress intended to cover. RG, if I wasn’t clear I apologize. I don’t have a problem with Congress closing the Deep South “loophole” where direct infringement could be avoided by exporting an otherwise infringing machine in its unassembled form. I don’t even have a serious problem with the language that Congress chose to use when it closed that loophole (although surely it could have been more clearly written). I do have a major problem with the majority’s interpretation of the 271(f)(1) in this case to cover the export of a single staple item of commerce for the reasons I’ve described. This is exactly correct and highlights the absurdity of the result reached here (regardless of the definition of inducement — both prongs of the majority’s analysis are way out in left field). It’s critical to understand: you and I and everyone else are free to manufacture and sell Taq polymerase enyzme. It’s in the public domain. That right can not possibly disappear — based on this statute — merely because I export the product. And surely it can’t make any difference what happens outside of the US if some kit comprising the product is never imported back into the US. It’s simply an absurd result. Even if the separate construction of the statutory terms in this case was reasonable (and they aren’t) the result itself should have been enough for the majority here to reconsider what it was doing. What a huge waste of everybody’s time. 271(f) is flimsy to begin with. The patent clause isn’t sufficient, it needs the commerce clause. To construe the statute in a manner that it doesn’t require a transfer of property probably renders it unconstitutional. Constitutionality aside, essentialness cannot be the standard, as by definition you can’t infringe without the inclusion of each item. If I had a patent for a system comprising a complicated 270 part machine and a pencil, the pencil is an essential item for infringement. I get their general viewpoint (that some limitations are more important than others, a truism many here don’t seem to understand), but while they got to the right result on substantial portion here their test for getting there is clearly wrong. I don’t disagree that some limitations might be “more important” than others according to some analysis/test. And I agree that the “essential” test applied here is clearly wrong. But I strongly disagree that they reached the right result here with respect tot their finding that the polymerase is a “substantial portion” of the combination for the purposes of this statute. More specifically, I would argue that a proper iinterpretation of the statute in light of the statutory history is that a “substantial portion” of a combination can never, ever include a solitary off-patent, public domain article of manufacture. The best construction of “substantial portion” would, in my opinion, require at least a plurality of uncombined articles that would — regardless of any other acts taking place outside or inside the US — be reasonably understood to represent an unassembled version of the patentable combination recited in the claim. That construction would keep 271(f)(1) distinct from 271(f)(2) because the latter applies to solitary items (and is really just a safety net for poor claim drafting). This part in bold is way beyond strange. Here we have a patent claim that describes a kit, where the kit includes numerous staple items that are in the public domain. One of those items is a polymerase enzyme which the defendant — and everybody else — is perfectly free to manufacture in the US and import wherever it pleases. There’s no way this bizarre holding survives a further round of review. Regarding the definition of “induce” issue: Black’s Law Dictionary, Sixth Edition (West 1990) contains the same definition as the one you cite from the Fourth Edition. I would hesitate to say that it generally demands a third party: “to bring about” seems to agree with the majority’s reasoning that the object of 271(f)(1) “induce” is the act of combining. You do make a great point about the broad interpretation of 271(f)(1) rendering 271(f)(2) superfluous – I can’t imagine what impact this would have on international trade if such a reading prevails. Thanks David. I’m not quite sure what to make of the earlier definition of “induce,” which is why I dropped it into a footnote. I’ve read it several times and it really depends on how you string together the different elements of the definition. Are they all part of one definition or are they separate definitions? And then there’s the problem of its source that I mention. The older (4th ed.) version that I’ve got in my office bases it on the Idaho case, in which the issue was not its legal meaning. I’m going to revise that footnote to be a more ambivalent, though. My intent in citing the Garner version of Black’s was to show how the word “induce” is understood in the law, as a proxy for citing cases and an extensive discussion of usage. How well one thinks this works depends on whether (1) you generally think that Garner does this, and (2) whether Garner’s description from 1999 reflects earlier understandings of “induce” or whether it’s use must be limited to only contemporaneous legal texts. That which prevails on a person to promote an act or acts by him, for example, fraud inducing the making of a contract. 23 AM J 1st Fraud Sec. 111.